STOP HS2 | Cameron calls to cut Judicial Reviews a fortnight before five on HS2. Cameron calls to cut Judicial Reviews a fortnight before five on HS2. 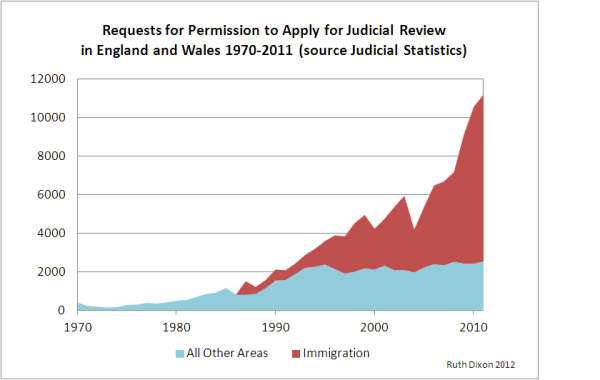 This graph shows a) The number of Judicial Reviews in recent years b) David Cameron doesn't have a clue what he is talking about. In a speech to the CBI, Prime Minister David Cameron has called for cutting access to justice relating to planning, wanting to make it harder to apply for Judicial Reviews. The Prime Minister stated that there are around four times the number of reviews now, as there were ten years ago. In a fortnight (December 3rd) the hearing of five Judicial Reviews into HS2 will start place, just weeks after the threat of Judicial Review on the West Coast Mainline franchise saw the process collapse and the Government forced into a humiliating U-Turn. Despite saying that the ‘growth industry’ in Judicial Reviews was holding back planning, the vast majority of the growth in Judicial Reviews is almost entirely to do with an increase in immigration and asylum cases. Once these are excluded, the underlying trend is flat. Additionally to this, if Mr Cameron wanted to ‘get more things built’, he would be increasing access to Judicial Review, as probably in part due to the prohibitive cost, the majority of planning related cases are in fact from developers taking planning authorities and inspectors to court, not from campaigners against development. I do not understand why the pensioners along the line do not all apploy for legal aid on mass to fight the case under the human right act the government is building this project useiing very old laws of the land before human rights were heard off surely if people can get aid to fight from blowing up targets in our country and awarded million pound houses to live in then we should be allowed to claim aid to fight our homes being taken away and our country side being destroyed by this venture so come on you legel buffs try and help us fight our case. Amen to that!Or,better still,for all those threatened with homelessness between Euston and Birmingham to refuse to move,like the elderly couple in China who have a motorway built around them.They appear to have more rights in a communist state. Cameron is so out of touch, at best, with all his money wouldn’t realise judicial reviews are very expensive to the man in the street. Just another kick in the teeth for civil liberty and demoracy, The bully, Her Cameron is so arrogant he can’t even consider he’s wrong. Which is the reason that the UK is a signatory to the Aarhus Convention – so that everyman has a chance to challenge the big boys and the big money. Do you think our Leader has heard of it? Or perhaps he’d like to remove that option too, along with the JRs, the ancient woodlands, flora, fauna and any quality of rural life. Joe, it’s not that ‘David Cameron doesn’t have a clue what he is talking about’ it is actually a very clever man along with his spin-doctors fiddling the statistics yet again and then labeling any rational argument countering dodgy government plans as ‘time-wasting’ when, in the case of HS2, the aim of the people is to prevent government from not only wasting vast sums but also from laying waste to some of England’s best countryside. And it is countryside which is nimby.